This essay by Mark Galasiewski originally appeared in The Elliott Wave Theorist in July 2006. It’s almost inevitable. At some time in your life, you’ll be on a car lot, shopping for new wheels. And almost certainly, while you’re motivated by price and features, styling also matters. But what drives that styling, the shapes, the colors? Cars reflect the spirit of their times; socionomics explains why. In 1985, Robert Prechter’s essay, “Popular Culture and the Stock Market,”1 published in The Elliott Wave Theorist, noted correlations between major movements in the stock market and cultural trends such as music, movies, fashion, politics and automobile styling. 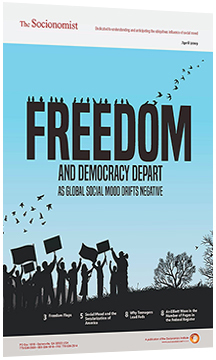 The cause of changes in the tone of all these phenomena, the essay proposed, was the same: a shared, unconscious social mood that swings naturally and inevitably between poles of optimism and pessimism. These surges register in the stock market, creating a “meter” of social mood. The idea that the cycles of history are neither random nor controllable was controversial at the time and remains so today. Socionomics cannot predict the nature and timing of every aspect of automobile styling, but it offers an excellent perspective from which to begin, as it does in the analysis of many types of social trends. Just as the Wave Principle works best with general market indexes, socionomics concerns itself with human behavior in the aggregate. As social mood begins rising—signaled by the stock market’s advance from a significant low—fashions become more colorful, and structure and tradition dominate popular art. By the time social mood peaks, bright colors and flamboyance dominate fashion, and wild colors and vitality rule popular art. “Popular Culture and the Stock Market” observed that “bright colors are associated with market tops and dull, dark colors with market bottoms.” As social mood begins falling, colors become muted and “anti-fashion” expressions begin to appear. When the social mood reaches its nadir, drab colors and conservative styles dominate fashion, and pop art is deliberately ugly, heavy, and “dead” looking. These same impulses influence automobile styling. During periods of rising mood, automobile frames are boxier. Hoods, roofs, sides and trunks are more rectangular. Straight, parallel lines and sharp angles have a definiteness that appeals to people when they are in the mood to solve problems and improve their lives. As the mood rises toward excess, consumers also demand more room, bigger engines and more sophisticated styling, prompting designers to push the limits of an automobile’s length, width, and height. Other bull market characteristics include hood ornaments and other chrome embellishments, which express individuality and flamboyance. Wider windows offer greater visibility. Convertible rooftops, the miniskirts of the automotive world, signal friskiness and fun. Motorcycles become popular: They increase visibility to the max. During periods of falling social mood, car frames are rounded. Bodies and roofs are bulbous; hoods and trunks are curved or snub as buyers seek the consolation of softer forms. Simpler styling and smaller capacities decrease total surface areas. Consumers and manufacturers also seek to increase efficiencies as protectionist mentality waxes (which is usually also expressed politically). Car bodies are more enclosed and windows are smaller and narrower as people seek to express less of themselves. Chrome disappears. By the end of the transition, convertibles are out of favor and only “delinquents” ride motorcycles. To test these ideas, we surveyed the past 85 years of automotive history, covering almost three complete cycles in social mood as reflected by the Consumer-Price-Index-adjusted Dow Jones Industrial Average. These cycles took place in 1921-1949, 1949-1982 and 1982-present. Representative automobiles discussed below either sold well or stand out in the collective memory of the culture as characteristic of their times. We divide our discussion of car styling into three sections: body form, roof style, and color. Our drive begins with the first complete cycle in the lifetime of the automobile: the bull market of the Roaring Twenties and the ensuing bear-market-dominated period of the 1930s and 1940s. As the 1920s bull market began, mass-market automobiles expressed the aesthetic values that socionomists recognize as characteristic of rising transitional mood: correctness, structure and tradition. • Henry Ford first produced his Model T (Figure 2) in 1908. The ensuing decade-long correction then eventually dampened sales. But when the social mood turned up in 1921, the car resurged in popularity, and production exceeded 1 million cars for the first time in its history. The narrow and angular “Tin Lizzie” sold well for several more years until Ford replaced it with a redesign of the 1903-1905 Model A. • Introduced in 1927, the new Ford Model A (Figure 2) retained the boxy features of the Model T. But unlike the all-black* Model Ts of the early 1920s, the new Model As were available in four colors (in addition to black)—a classic example of a company responding to consumer demands for flashier styles in the middle of a boom period. The new Model A immediately became the company’s second great sales success, with sales hitting 1.3 million in 1929. But its promise was short-lived. Social mood collapsed in the 1929-1932 bear market, and Ford terminated Model A production in 1931. • Ever wonder where the admiring phrase “It’s a doozy!” came from? The Duesenberg J (Figure 2) was the prince of the American auto world when it was unveiled at the New York Car Show in 1928. Its rectangular body was custom-designed and comparable in quality and luxury to a Rolls Royce. An engine derived from those used in American fighter planes during World War I powered it. Earlier in the 1920s bull market, the Duesenberg brothers had made a name for themselves after a prototype of the Duesenberg Model A became the first American car to win a European Grand Prix race in 1921 (and, incidentally, would remain the only American car to do so until the 1960s). Duesenberg cars also won the Indianapolis 500 in 1924, 1925, and 1927. Initially, the brothers failed in their attempt to market their high-performance cars to the non-racing public and went bankrupt in 1922. But after Errett Lobban Cord added the brothers and their company’s assets to his expanding automotive empire in 1926, the Model J was born. It instantly became the darling of well-heeled gangsters and Hollywood celebrities as the 1920s roared to a close. In 1932, Cord produced a supercharged (“SJ”) version of the car with 320 horsepower and a top speed of 135 MPH that attracted such notable owners as Clark Gable and the Duke of Windsor. But by then the market for large, boxy, high-performance or luxury automobiles had dried up. Dash and flash no longer sold. The new environment required modesty and practicality. • The Stout Scarab (Figure 2, and right) was the brainchild of William B. Stout, an automotive and aircraft engineer who had worked for the Packard Motor Car Company during World War I. Stout is most famous as the designer of the Tri-Motor airplane, which Ford acquired when it purchased Stout’s aircraft manufacturing company, the Stout Metal Plane Company, in 1924. After a dispute with Ford over the plane, Stout left the company in 1932. In that year he produced a prototype of the Scarab, and his new venture, the Stout Motor Car Company, began limited production of it in 1935. With a long wheelbase and removable seats, and without a driveshaft, the Scarab was very spacious—a Volkswagen bus or a modern minivan before its time. Although Stout made only nine Scarabs, the design attracted such high- profile customers as industrial magnates Harvey Firestone, Philip Wrigley, and Willard Dow. General Eisenhower even used one in North Africa during World War II as a mobile office, which he later gave as a gift to France’s General De Gaulle. The car’s expensive price tag of $5,000 helped ensure limited production. Nonetheless, the Scarab’s style expressed in the extreme the classic formal manifestations of negative social mood—enclosed, rounded bodies, snub noses, and small windows—that would come to characterize later bear market cars. • The 1934 Chrysler (also DeSoto) Airflow (Figure 2) was the first mass-produced American car to be designed in a wind tunnel and to utilize unibody construction. Although its unorthodox features initially steered consumers away, the model set the popular precedent for bear market car designs with its pug nose, curved lines and bulbous frame. • Pontoon fenders, a wraparound “coffin nose” grille, and hidden pop-up headlights helped the Auburn Cord 810/812 (below) become the darling of auto shows in New York, Chicago, and Los Angeles in 1935. It attracted 7,639 requests for more information. It also represented the Cord Corporation’s last dying breath. In the 1930s, unable to sell the super-luxury cars that had made him famous in the 1920s, E.L. Cord had come to rely on profits from the corporation’s kitchen cabinet division to subsidize its automotive divisions. The model 810, the company’s first visible nod to the realities of the new mood, looked at first to be the company’s salvation. Instead, it was too little too late. Cord closed the Auburn division in August 1937 and liquidated his corporation’s remaining assets several months later. • As the stock market’s corrective process neared its end in 1949, the amorphousness that attends bear market designs reached an extreme in the 1948 Studebaker Starlight Coupe (top, page 6). The rear of the car, which had four windshield-like curved windows and a large bulge in the center of the trunk that looked like it might have housed an engine, appeared so much like the face of an automobile that people said they “couldn’t tell if it was coming or going.” In that sense, the car’s form was a fitting metaphor for the end of an exhaustive correction in a stock market that on an inflation-adjusted basis was still down by two-thirds after 20 years. • The “Classic” Ford Thunderbird (Figure 3) featured chrome “bullets” on the grille, exhaust pipes that emerged from the rear bumper, and pointed headlight covers that appeared to extend in a straight line back to the tailfins (which tilted outward on the ’57 model in Figure 3). Ford introduced the T- Bird in 1955 in the middle of the post-war economic expansion. The second generation of the car, introduced in 1958, was so sharply angular and formal, and its sides hung so low, that it became known as the “Square Bird.” That year, the new Thunderbird won the first of the three Motor Trend “Car of the Year” awards that it would eventually collect, and its sales success prompted designers to duplicate its rectangular features across all Ford lines. The 1962 Thunderbird Sports Roadster attracted several prominent owners, including Elvis Presley. • The Chevrolet Impala (Figure 3) was similar in its rectangular form to the Ford Thunderbird. Introduced in 1958, it became the best-selling automobile in the United States in 1960 and maintained that rank through the end of the decade. In 1965, just prior to the peak of the inflation-adjusted DJIA the following year, Chevrolet sold one million Impalas, an industry record for the period for a single model in a year. • The General Motors Cadillac (Figure 3) of the 1950s and early 1960s was the champion of the post- Depression boom. It featured broad sides, sharp corners, and an ostentatious front grille. Leading the automotive avant-garde, GM styling chief Harley J. Earl placed conical, artillery shell-inspired “Dagmar” bumpers on the Cadillac as early as 1946. Then, inspired by the twin rudders on the Lockheed P-38 Lightning aircraft, Earl added angular tailfins too in 1948. In later years other manufacturers would add these speed symbols to their models. Tailfins reached their peak expression in the 1959 Cadillac Eldorado (see right) smack in the middle of the postwar expansion. In 1964, the Cadillac sealed its image as the dominant automotive icon of the 1950s and 1960s bull market when a black limousine “Caddie” pulled up in front of New York City’s Madison Square Garden to deliver the Beatles to thousands of screaming U.S. fans. • By the time the Dow peaked in inflation-adjusted terms in the mid-1960s, society’s preference for angularity and complexity had reached such an extreme that on its Mercury Monterey, Parklane and Breezeway models, Ford offered a rear window that cut inward (see 1965 Monterey at right), coming up with yet another angle in producing angles. In 1966, at the top of the great “wave III” in wave terms, the U.S. automobile manufacturing industry was the envy of the world. But by the end of the subsequent 16-year decline in the inflation-adjusted DJIA, the U.S. car makers had ceded considerable ground to overseas competitors, and one of the “big three” manufacturers (Chrysler) was on the brink of bankruptcy, finally to be bailed out by government-guaranteed loans in 1981, the final full year of the inflation-adjusted bear market. Popular cars over the period followed a similar path, as manufacturers and consumers were increasingly willing to experiment with non-traditional—and even faulty—designs. • The popularity of the Volkswagen Beetle (Figure 3) in the United States in the late 1960s and early 1970s is a classic manifestation of the mixed sentiment that can attend the early stage of a social mood decline. The car began production as Adolph Hitler’s “people’s car” in the bear market year of 1938. A design that Dr. Ferdinand Porsche had envisioned in the stock market bottom year of 1932 served as its model. The Beetle then migrated to the United States in 1949, the final year of the bear market period. Following the peak in the inflation-adjusted stock market in 1966, the Beetle—along with its minivan sister, the VW Bus—was a popular canvas on which counterculture hippies and flower children painted symbols of peace and love. In the bear market rally year of 1968, the car was the centerpiece of a popular film, The Love Bug.2 The Beetle displaced the Ford Model T as most produced car in history in 1972, when lifetime production exceeded 15 million units. Volkswagen stopped selling the model in the United States in 1978 toward the end of the inflation-adjusted bear market. • Along with the Chevrolet Vega and the AMC Gremlin, the Ford Pinto (also Mercury Bobcat) represented the U.S. automobile industry’s contribution to the rising popularity of small imported cars during the early 1970s. The basic hatchback or coupe model had a wide, sloping rear-end, giving the back of the automobile a football-like shape. A wagon version of the vehicle, called the Ford Pinto Cruising Wagon, even sported a small, round “bubble window” in place of rear side windows (see right), a feature also popular on many conversion vans of the period. In the midst of its production run from 1971 to 1980, the Pinto became the subject of a scandal. Internal documents showed that Ford executives had decided to ignore a design flaw that made the gas tank susceptible to explosion upon rear impact. Their reasoning was that settling death suits would be cheaper than spending $11 per car to fix the problem— a classic example of the “fuzzy” thinking that accompanies negative social mood. Incidentally—in another testament to the power of fuzzy thinking to produce memorable failures—the Vega, Pinto, and Gremlin respectively now rank second, third, and fourth on the popular radio show Car Talk’s listener-determined list of the “Worst Cars of the Millennium.” Every one of them is a bear market car. First place, by the way, went to the Yugo GV, which was designed in 1981 near the bottom of the bear market. The 1970s was also the worst decade for Jaguars, about which owners quipped, “you have to store a mechanic in the trunk.” In “Popular Culture and the Stock Market,” Prechter wrote, “1970s pop art, produced during the bear market, generally consisted of massive hunks of dark iron or stone sculpture, much of which was detested for its ugliness and later removed.” The same can be said—for the same underlying reason—of many 1970s automobiles. • American Motors Corporation chief stylist Richard A. Teague originally envisioned the AMC Pacer (Figure 3) as a futuristic bubble-like vehicle as shown in his initial 1971 sketch of the concept at right. The final version of the car had a more traditional small-car front, but came close to retaining the rounded backside that Teague had intended for it. He achieved this aspect of the design by using rounded rear glass window panels—an innovation not seen since the Studebaker Starlight Coupe in 1948. Its spherical appearance was so striking that when it was introduced in 1975, reviewers called it a “fishbowl on wheels” and a “jellybean in suspenders.” The Pacer sold 145,528 units in its first year, or about half of its total six- year production run, which spanned most of the second half of the inflation-adjusted bear market in the DJIA. The positive social mood that emerged from the ashes of the early 1980s drove not only the economy but also the appearance and function of automobiles. The automobile industry began producing cars that expressed the increasingly optimistic society’s rediscovery of scientific achievement and boldness. • Introduced in 1981, a year before the end of the 16-year correction in the inflation-adjusted stock market, the De Lorean DMC-12 (Figure 4) was a car ahead of its time—but only by a few years. It featured Giorgetto Giugiaro’s angular “folded paper” design, stainless steel paneling, and mechanical gull-wing doors. Such Space Shuttle-age styling oozed scientific precision—a theme last seen in the “rocket ship” tailfins and “nose cone” protuberances of stylish 1950s automobiles. But the market’s mood was not ready for such flair. John De Lorean produced only about 8,600 units of his dream car before his company went bankrupt in 1983. Just two years later, the car reemerged in popular culture in a blockbuster film, Back to the Future. In the movie, a scientist converts a De Lorean into a time machine in which a young man travels back in time to the year 1955. The choice of both destination and vehicle was appropriate. The social mood in both 1985 and 1955 was in a rising transition stage. The De Lorean in the film served as a vehicle for the hopes and ambitions of many as the 1982-2000 bull market took off. • The Volvo 200 Series (Figure 4), also born in 1974, was popular with large middle class families until the company replaced it in 1993. Its boxy design and safety aspects were symbols of the emerging bull-market’s conformity and correctness values. • The Lincoln Town Car (Figure 4) was introduced in 1981. It benefited greatly from the 1982-2000 bull market and became Ford’s best-selling luxury car. The Town Car was one of the longest cars produced in the United States, and its side trims and hood ornament suggested establishment and tradition. The popularity of the original design was so enduring that designers modified the car only once (in 1990, making only minor cosmetic changes) before a decidedly bear-market version of the automobile appeared in 1998 (see 2002-Present below). • The AM General Hummer (Figure 4), a civilian version of the U.S. military’s M998 High Mobility Multipurpose Wheeled Vehicle (HMMWV or “Hum-vee”), was the archetype of late 20th century consumer extravagance. Its heavy weight, high cost and poor fuel efficiency epitomized excess, its military pedigree, tank-like paneling, and complex grille projected muscularity and vigor, and its boxy angularity exuded manly decisiveness. The 1991 Hummer quickly attracted the attention of such bull market icons as the CEO of Coca-Cola at the time (who purchased the first 15) and Arnold Schwarzenegger (who reportedly purchased the first two Limited Edition versions and now owns eight Hummers in all). General Motors, attracted by the Hummer’s $20,000 per-vehicle profit margin, purchased the brand in late 1999—just in time for the end of the major bull market. The 2000 peak in the stock market will probably mark the end of the SUV expansion era as well (for this cycle, at least). Production of the largest SUV ever, the Ford Excursion, began in that same year. In 2005 Ford eliminated the Excursion, and last month (June 2006) GM joined the downsizing trend as it stopped production of the Hummer H1, the largest of the Hummer models. • Initially shown as a concept car at the North American International Auto Show in the bear market year of 1994, the Volkswagen New Beetle (Figure 4) entered production in the correction year of 1998, just months after the all-time high in the Value Line (geometric) Average of stock prices. That year the DJIA dipped 20%, and VW’s reincarnated bear market icon gave a preview of the coming trend in automobile styling. The New Beetle was Motor Trend’s Import Car of the Year for 1999, and it continued to sell briskly throughout the 2000-2002 decline. • As noted earlier, in 1998 the Lincoln Town Car (at right) went under the knife for its first major cosmetic change, reappearing with its edges softened considerably and its hood ornament removed. • The blunt-nosed grille of the 1934-Airflow-inspired Chrysler PT Cruiser (Figure 4) has been a common sight on city streets since the company introduced the model in the starting bear market year of 2000. In 2001, the car won the “North American Car of the Year” award. But in 2003, as the stock market began a bear-market rally, demand dropped off considerably. In an attempt to spur sales, Chrysler wisely introduced a convertible version in 2004. But during the rally, the popularity of the PT Cruiser fell off considerably. • The new Dodge Magnum (Figure 4), introduced as a concept car near the 2003 stock market low, has the potential to pick up the bear market baton. Its blunt nose gives it a tough, truck-like look and its narrow windows recall models from the 1930s and 1940s. Unlike traditional station wagons, its roof slopes downward in back, giving its backside a rounded appearance. In 2004, Road & Track Design Director Richard Baron predicted, “a lot of sport-utility-vehicle owners probably would look favorably upon the Magnum and climb down from their oversize trucks.”1 We shall see. • Like water hitting a stone, the forces of negative mood continue to smooth edges, even those of the most established bullish icons. Would you ever have guessed that the ancestors of the car pictured at right were once nicknamed “bricks”? Fans know this car as a Volvo 2006 S60 5T. In the early years of the automobile industry, all cars were open cars, reflecting their evolution from buggies and bicycles. But particularly after the introduction of Edward Budd’s all-steel body in the bear-market year of 1914, enclosed cars increasingly became the standard. Closed-body vehicles outsold open vehicles for the first time in 1925. In 1927, though, no less than nine manufacturers (Buick, Cadillac, Chrysler, duPont, LaSalle, Lincoln, Stearns, Whippet and Willys) introduced the first true “convertible” roofs. The innovation was a response to the demand for adventure and flash that accompanied the 1920s mania. The market peaked in 1929, the year that saw the release of the most luxurious convertibles ever—including those made by Auburn, Cadillac, Chrysler, Cord, Duesenberg, Marmon and Packard. But only a socionomist knows why the public stopped buying them. In 1982, the dour social mood responsible for Americans’ waning interest in convertibles came to an end, signaled by the end of a 16-year corrective pattern in the DJIA. In that year, Chrysler sold 23,000 convertible LeBarons, an unexpected sales success that prompted other manufacturers to begin making convertibles again. By the late 1990s, convertibles recovered to their present level of around 3% of U.S. new car registrations, still short of their postwar highs. This observation is consistent with the personality of 5th waves identified by Frost and Prechter in their 1978 book The Elliott Wave Principle: “Fifth waves in stocks are always less dynamic than third waves in terms of breadth.” The fact that convertibles, although popular, were not as popular as they were in the late ’60s is to Elliott wave analysts, another confirmation that the 1980s and 1990s’ boom period was the last in a five-wave, multi-decade growth pattern. 1 Readers may access the 1985 essay in Pioneering Studies in Socionomics (2003), available individually at www.elliottwave.com/store or as part of a two-volume set, Socionomics: The Science of History and Social Prediction at www.socionomics.net/books.aspx.